In a laboratory tucked away off a noisy New York City street, a soft-spoken neuroscientist has been placing Tibetan Buddhist monks into a car-sized brain scanner to better understand the ancient practice of meditation. But could this unusual research not only unravel the secrets of leading a harmonious life but also shed light on some of the world's more mysterious diseases? Zoran Josipovic, a research scientist and adjunct professor at New York University, says he has been peering into the brains of monks while they meditate in an attempt to understand how their brains reorganise themselves during the exercise. 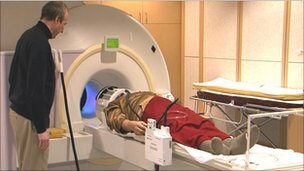 Since 2008, the researcher has been placing the minds and bodies of prominent Buddhist figures into a five-tonne (5,000kg) functional magnetic resonance imaging (fMRI) machine. The scanner tracks blood flow within the monks' heads as they meditate inside its clunky walls, which echoes a musical rhythm when the machine is operating. Dr Josipovic, who also moonlights as a Buddhist monk, says he is hoping to find how some meditators achieve a state of "nonduality" or "oneness" with the world, a unifying consciousness between a person and their environment. "One thing that meditation does for those who practise it a lot is that it cultivates attentional skills," Dr Josipovic says, adding that those harnessed skills can help lead to a more tranquil and happier way of being. "Meditation research, particularly in the last 10 years or so, has shown to be very promising because it points to an ability of the brain to change and optimise in a way we didn't know previously was possible." When one relaxes into a state of oneness, the neural networks in experienced practitioners change as they lower the psychological wall between themselves and their environments, Dr Josipovic says. And this reorganisation in the brain may lead to what some meditators claim to be a deep harmony between themselves and their surroundings. Dr Josipovic's research is part of a larger effort better to understand what scientists have dubbed the default network in the brain. He says the brain appears to be organised into two networks: the extrinsic network and the intrinsic, or default, network. The extrinsic portion of the brain becomes active when individuals are focused on external tasks, like playing sports or pouring a cup of coffee. The default network churns when people reflect on matters that involve themselves and their emotions. But the networks are rarely fully active at the same time. And like a seesaw, when one rises, the other one dips down. This neural set-up allows individuals to concentrate more easily on one task at any given time, without being consumed by distractions like daydreaming. "What we're trying to do is basically track the changes in the networks in the brain as the person shifts between these modes of attention," Dr Josipovic says. Dr Josipovic has found that some Buddhist monks and other experienced meditators have the ability to keep both neural networks active at the same time during meditation - that is to say, they have found a way to lift both sides of the seesaw simultaneously. And Dr Josipovic believes this ability to churn both the internal and external networks in the brain concurrently may lead the monks to experience a harmonious feeling of oneness with their environment. Scientists previously believed the self-reflective, default network in the brain was simply one that was active when a person had no task on which to focus their attention. But researchers have found in the past decade that this section of the brain swells with activity when the subject thinks about the self. 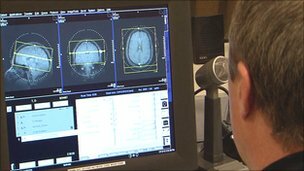 The default network came to light in 2001 when Dr Marcus Raichle, a neurologist at the Washington University School of Medicine in the US state of Missouri, began scanning the brains of individuals who were not given tasks to perform. The patients quickly became bored, and Dr Raichle noticed a second network, that had previously gone unnoticed, danced with activity. But the researcher was unclear why this activity was occurring. Other scientists were quick to suggest that Dr Raichle's subjects could have actually been thinking about themselves. Soon other neuroscientists, who conducted studies using movies to stimulate the brain, found that when there was a lull of activity in a film, the default network began to flash - signalling that research subjects may have begun to think about themselves out of boredom. But Dr Raichle says the default network is important for more than just thinking about what one had for dinner last night. "Researchers have wrestled with this idea of how we know we are who we are. The default mode network says something about how that might have come to be," he says. "If you look at Alzheimer's Disease, and you look at whether it attacks a particular part of the brain, what's amazing is that it actually attacks the default mode network," says Dr Raichle, adding that intrinsic network research, like Dr Josipovic's, could assist in explaining why that is. Cindy Lustig, associate professor of psychology and neuroscience at the University of Michigan, agrees. "It's a major and understudied network in the brain that seems to be very involved in a lot of neurological disorders, including autism and Alzheimer's, and understanding how that network interacts with the task-oriented [extrinsic] network is important," she says. "It is sort of the other piece of the puzzle that's been ignored for too long." Dr Josipovic has scanned the brains of more than 20 experienced meditators, both monks and nuns who primarily study the Tibetan Buddhist style of meditation, to better understand this mysterious network. He says his research, which will soon be published, will for the moment continue to concentrate on explaining the neurological implications of oneness and tranquillity - though improving understanding of autism or Alzheimer's along the way would certainly be quite a bonus. The Subtle Body as the Mind's User-interface.